In essence, bots are small pieces of code that are programmed to do a particular task again and again. Old style bots were built based on a set of rules. They were replicators. Rule bots that did A when they came across B, C if they came across D. A trigger could generate a specific response or a set of responses. As technology and algorithm science advanced, it gave birth to chat bots. We will explore the base elements that go towards the construction of a chatbot for FAQ s.
The big difference is the interaction layer which is driven more by a chat messenger platform. The chat platform provides for users to interact with the chatbots published on it as if it would with another human being. So a chatbot replicates the identity schematics of a human entity to register on the chat platform. You can invoke a chatbot in the same fashion as you register or start a conversation with another human being. The core essence of the chatbot is the engine – it receives messages that users type while interacting with it, interprets them and searches its database for the best response for it. This is a base level Response Bot or FAQ bot. When the processing engine receives a request from a user, it does a keyword extraction from the question and tries to match it to questions in its database. When it finds a match, it assigns a probability to the match. This is more of a simplistic looking up with probability matching. The engine then returns the most probable answer it finds on the asked question. You can set thresholds in the bot, say a 40% probability match. If it does not come up with the answer that meets or exceed the 40% probability threshold, it will provide a default answer to the user query. Say “I am sorry I did not understand your response. Can you change the question and ask it differently”. This is not scalable and hence, customers will find it difficult to interact with the bot. We need a more sustainable process that is fast and efficient. Then only users will want to interact with the chatbot, the very reason we have designed the bots in the first place. You can “train” the bot by..
.. studying the pattern of questions that users ask. The quality of the bot keeps improving over time as more answers come into the database. You “train” the bot as it encounters more and more queries. This, however, is the base level FAQ bot and the story gets even better as we explore more of where platforms like Engati have reached. 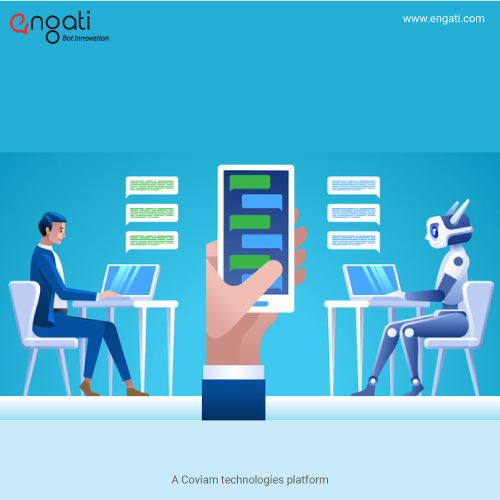 Try out the new world of chatbots using an open, best of breed platform like Engati for free. It does not require any programming experience and lets you craft intelligent paths to handle the interaction interface of the future. Be the bot be a personal bot about you or a bot that provides for the first line of support and information to your business, product or service. Predictions are by 2021, 60% of all industries will be using bots extensively. Time to start on your journey today and get a head start over the others? Stay tuned to continue on the bot journey with us. Moreover, there is a lot to discover and explore in this field. If you’d like to know more, schedule a demo for free!